MicroLaserPeels produce a fresher, smoother surface by vaporizing off the outer 10 - 50 microns of dull, dead skin, compared to a treatment like microdermabrasion, which removes only about 10 microns of outer skin. Because more of the skin can be removed with the MicroLaserPeel than with noninvasive treatments, more improvement is achieved with texture, patchy pigment, sun damage, pore size appearance and fine lines. People describe their skin treatment results as seeing their skin go from tired looking to glowing. Unlike deeper Laser Peels, MicroLaserPeels can be done on any part of the body and are an excellent choice for skin rejuvenation of the neck and chest with minimal down time. A cream anesthetic is applied before the treatment to minimize discomfort. After the treatment most people describe the sensation as like a sunburn which usually lasts less than a day. The treated skin usually is red for up to 5 days (occasionally longer, especially in extremely fair skin) after each session with some peeling expected on days 4-5. Results of the treatment continue to improve for the following few months. Laser Peels vaporize off a thicker layer of outer skin than a Micro Peel but not as deep as Resurfacing, so it produces more dramatic results than a Micro Peel. Fine lines & skin texture become smoother & deeper brown spots may be erased. 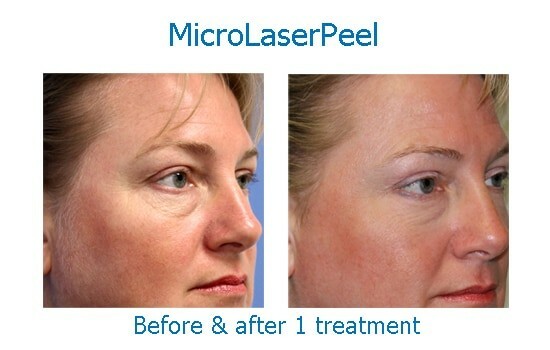 Because it's a deeper treatment than a Micro Peel, significant results can be seen with just one treatment. Anesthetic cream is applied before the treatment to decrease discomfort & people describe the feeling during treatment as somewhat stingy & hot. After the treatment cold packs are applied followed by a soothing ointment. Recovery consists of slight swelling and crusting for 1-3 days, with redness usually persisting for up to 10 days, depending on the depth of the peel. If you are interested in learning more about how laser treatments can improve your appearance, schedule a complimentary consultation by registering online here or by calling 727-571-1923.